Halloween is nearly upon us and so many are focused on friends and family coming to visit and crisp nights taking our kids out trick or treating. However, a few like me are confined to our couches and front doors handing out candy and happily watching our favorite spooky movies. My personal favorite during the Halloween festivities is Ghostbusters. And I think it’s fair to say that a closer look and comparison between the Ecto-1 cars is in order. Ecto-1. A classic. A visual feast of auto design and movie magic. Where did it come from and why was it used? Early scripts called for a 1975 Cadillac ambulance. A dark and sinister haunted car was supposed to be the fifth member of the Buster crew. The car was originally penned as black and purple with white strobes giving it a “beyond the grave” appearance. It also would have power from beyond allowing it to dematerialize and travel through different dimensions so the Ghostbusters could travel in time and enter the realm of the dead. But this concept never reached the silver screen. And the color scheme was tossed due to so many nighttime shots restricting the dark paint job. Instead of the planned ’75 caddy, the 1959 model Cadillac chassis, built by the Miller-Meteor company, was given the greenlight. The ambulance/hearse combination was the end-loader variety. 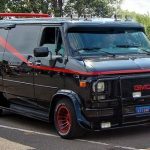 While Dan Aykroyd’s character states the vehicle’s price at a reaction-inducing $4,800 to a shocked Bill Murray, the actual purchase price was far lower at $1,400. After repairs were complete, the vehicle had quite a unique character. The tailfins on this icon were the largest to appear on a production car. They’re the same from the 1959 Cadillac Eldorado. This was a limited production run. Less than 400 vehicles were made. 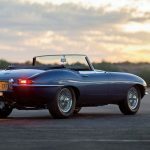 The powerplant was a 6.3-liter V-8, good for 320 hp. This was immense until you factor in the car’s curb weight: around 3 tons. 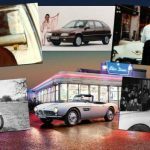 At nearly 20 ft. long, the Cadillac Miller-Meteor was an unwieldy car to handle, though it was a graceful ride thanks to the air suspension system. Stephen Dane was the Ecto-1’s designer. He was tapped by director Ivan Reitman to design and oversee the development of the car from scratch. He also designed many of the complicated technical gear including the Proton Pack, the Particle Thrower, the Ghost Trap, The Spectral Meter, Slime Scooper and Slime Blower (from the second film)—all within two weeks of the start of shooting. Two Miller-Meteors were purchased and used, but the converted one was primarily used during filming. The primary vehicle was originally a gold ambulance. The secondary vehicle was for the early pre-modification scenes. 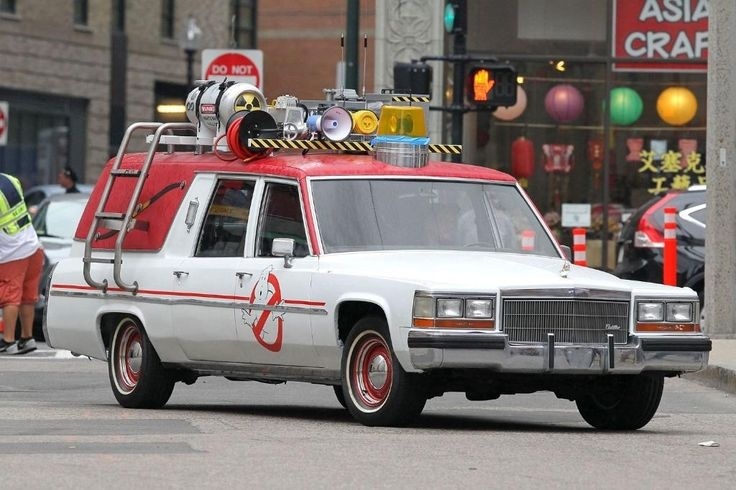 Rumors subsist that the original Ecto-1 was driven around New York City shortly after the movie’s release in 1984, with one of the Ghostbusters in costume. 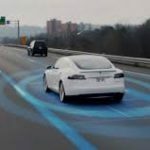 Some reports indicate that a slew of accidents happened with this promotion because other drivers were gazing in such wonder they stopped paying attention to the road. This wasn’t the only incident related to the car and traffic. There are shots from the film on the Brooklyn Bridge while shooting Ghostbusters II showing the car backfiring and billowing smoke. These were not special effects; the car was actually dying on the road. It caused such a huge traffic jam, the NYPD fined the production company. Luckily the crew had a spare from the unused conversion on the first film. This one is lovingly referred to as Ecto-1a and can be seen in the second film. The Ecto-1 from the latest Ghostbuster’s movie is also a Cadillac, but this time it’s a Reagan-era Fleetwood hearse. This is an interesting aesthetic choice to pull something nearly 30 years old like in the original film, but without those great flowing lines from the 60s. In my view it’s a loss of style for a touch of nostalgia. 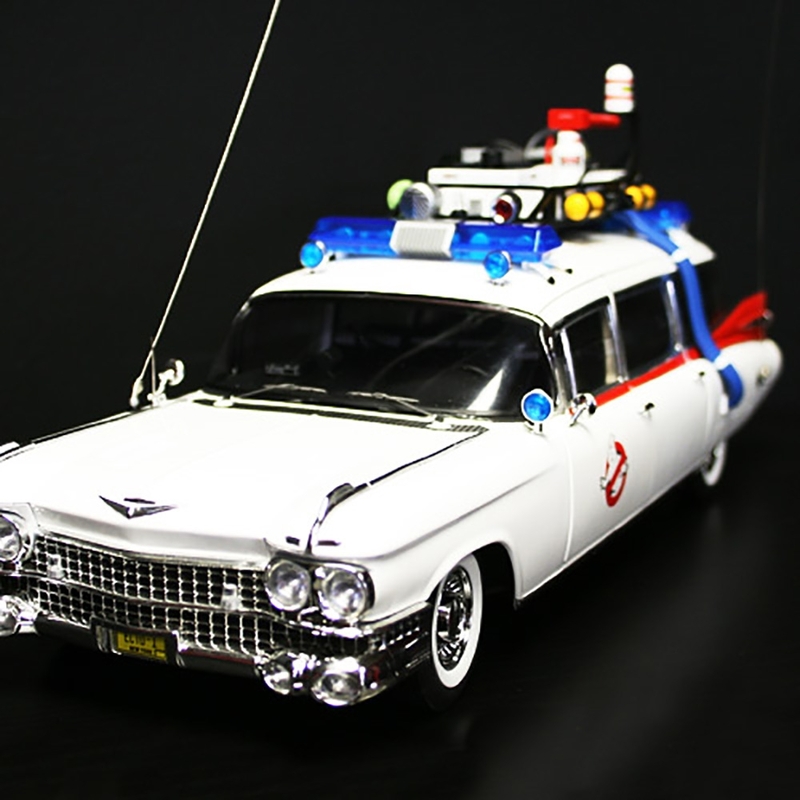 One addition that’s very iconic to the new Ecto-1 is the unique ghost hood-ornament. In July 2016, Shawn Thorsson blogged about the creation of the hood ornament for the new Ecto-1. 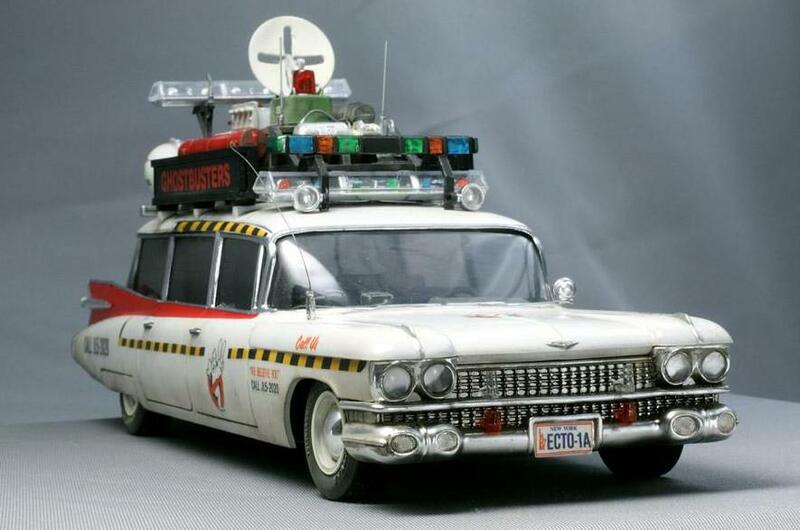 This was the first concept people were seeing from the new Ecto-1. Peter Rubin, one of the concept artists, spoke with Paul Feig, the art director, about adding a hood ornament. He did some quick sketches. The next morning at around 6 am, Rubin called his friend, Shawn Thorsson to work on the ornament. Within 24 hours, the project was greenlit. Principal photography was about to start within a week in Boston. Rubin sent Thorsson his 3D models. Within days of work, the models were used and shown via social media. 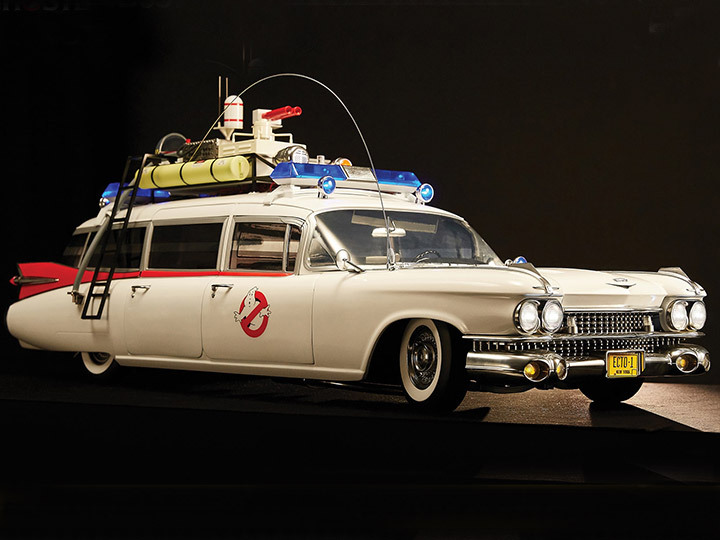 The classic Ecto-1 has a history of problems and excitement with fans who have tried their best to recreate and preserve this classic movie car. There’s even a community that’s crazy about making and preserving these Cadillacs as their own personal piece of movie history. Whether or not you’re thinking about Halloween, some cars just have a way of haunting you. Previous Are Colored Tires the Next Big Thing?